A total classic for fall: this pumpkin bread is moist, easy to make, and just sweet enough, with plenty of cinnamon, nutmeg and cloves. Can you believe it? The last few days of September are quickly dwindling. We saw a 15 degree drop overnight on Wednesday night. Soon the leaves will start to change. It’s really beginning to feel like fall! I know the internet gets FLOODED with pumpkin recipes, starting, oh, around August? And I’m well aware that it can be annoying to a lot of people (myself included, a lot of times!). Even though I’m always really excited to start fall baking, I try my best to refrain until the timing is right. And it’s almost October my friend, and October means one thing in my world: pumpkin. Nothing screams fall like pumpkin and spice. I’ve got lots of pumpkin recipes to choose from here on Baking a Moment. If you’re a pumpkin lover, definitely check out this pumpkin pie, this pumpkin chocolate Halloween cake, and these pumpkin cheesecake bars. But today, we are talking pumpkin bread. It’s definitely a fall favorite! I love it because it’s so quick and easy to make, and it’s moist and just sweet enough, with plenty of warm spice. 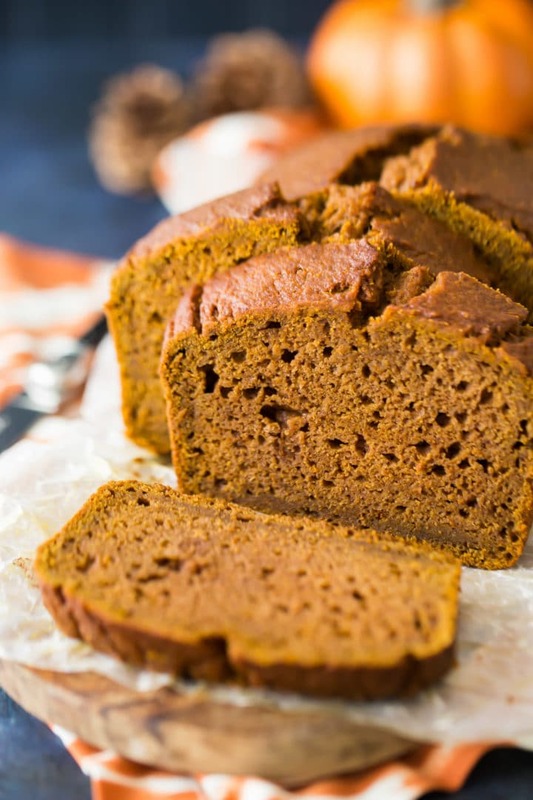 This pumpkin bread recipes is so super-simple to make. You’ll love how quickly it comes together! Start by combining all the dry ingredients in a big bowl. Flour, brown sugar, cinnamon, baking soda, salt, nutmeg, and cloves. Just give them a quick whisk to combine. You may notice in the video below that I am using whole nutmeg. If you have not tried this, I highly recommend it! The flavor is totally off the charts. You only need a little bit, because it’s so intense. Just scratch the nutmeg over a microplane grater and get ready for the most incredible aroma! Once your dry ingredients are combined, gather your liquid ingredients. A whole can of pumpkin puree (make sure it’s pure pumpkin and not pumpkin pie filling), melted butter, eggs, Greek yogurt, milk, and vanilla can all get stirred together until smooth. Now just pour the liquid ingredients into the dry, and fold everything together gently. The less you mix, the more tender your pumpkin bread will come out. Don’t worry if the batter looks a little lumpy; that’s perfectly ok! Bake the pumpkin bread for 60 to 75 minutes. You’ll know it’s done when it’s puffy and deep mahogany brown, and a toothpick inserted in the thickest part of the loaf comes out clean or with just a few moist crumbs. CAN THIS RECIPE BE MADE GLUTEN-FREE? CAN THIS PUMPKIN BREAD RECIPE BEEN MADE INTO MINI LOAVES OR MUFFINS? The pumpkin bread you see in these pics and video was baked in a standard loaf pan (5 cups, or 1.5 liters). But this recipe could also be baked in 3 mini loaf pans. Just adjust the bake time as needed. You’ll know your mini pumpkin loaves are done when a toothpick inserted into the thickest part of a loaf comes out clean or with a few moist crumbs. If you’re looking to make pumpkin muffins, look no further than this recipe: Pumpkin Muffins. It’s my younger son’s favorite! I think you will really love it too. 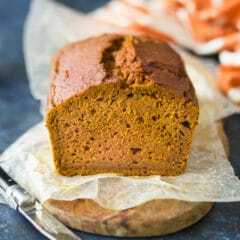 Pumpkin bread is great for breakfast or brunch, or for an afternoon snack. It’s delicious toasted, with a little smudge of soft butter or apple butter. And I especially love it with a hot cup of tea, coffee or cocoa. HOW LONG DOES PUMPKIN BREAD LAST? Once your pumpkin bread has completely cooled, you can slip it into a zip-top bag so that it doesn’t dry out. It will keep at room temperature for a couple of days; in the fridge for about a week. It can also be frozen. Wrapped tightly, it should last in the freezer for at least a month. 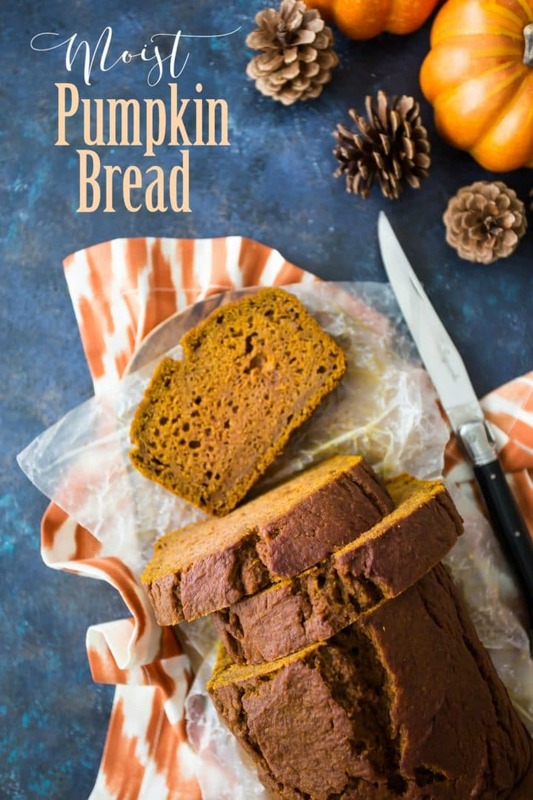 Celebrate fall with this easy, pumpkin bread recipe! It’s such a tasty treat! Preheat the oven to 350 degrees F, and mist a 5-cup loaf pan with non-stick spray. Place the flour, brown sugar, cinnamon, baking soda, salt, nutmeg, and cloves in a large mixing bowl and whisk to combine. Place the pumpkin, butter, eggs, Greek yogurt, milk, and vanilla in a smaller bowl and whisk to combine. Add the pumpkin mixture to the flour mixture, and fold together until just barely combined. Transfer the batter to the prepared pan, and bake for 60 to 75 minutes, or until a toothpick inserted in the thickest part of the bread comes out clean or with a few moist crumbs. Cool for 20 minutes in the pan, then remove to a wire rack and allow to cool completely before slicing. *Sour cream or buttermilk can be substituted. If you don’t have buttermilk, you can substitute by stirring 3/4 teaspoon of lemon juice or white vinegar into 3 tablespoons of regular milk. Allow the mixture to stand for 5 minutes, or until thickened and slightly curdled. 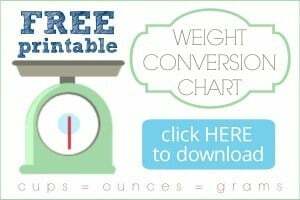 Love your recipes, but was wondering if you could provide suggestions for milk-product substitutions to use instead of butter and if there is an appropriate ratio when making the substitution? Hi Christine! If you look for a butter substitute that can swap 1:1 for dairy butter, it should work well. Same goes for milk, yogurt, etc. Hope that’s helpful! This looks so good! I like the use of yogurt for moisture and the dark brown sugar to add a deeper flavor. Yum! This looks so good! One question, the only sugar you use in this recipe is brown sugar, no white? Hi BJ! Yes that’s right, I only used brown sugar for this recipe. Hej. A suggestion: when using the tab “metric” for measurement, it would be great to get butter in grams and temperature in Celsius. Also, I baked using the metric measures, and the ratio of dry:wet ingredients was off. Maybe bc I used purée made of an actual pumpkin … but pumpkin purée is not available in Netherlands. Thanks for the great suggestions Ania! If your pumpkin is very wet, it’s helpful to drain it in a fine-mesh sieve for a while before adding it to the batter. 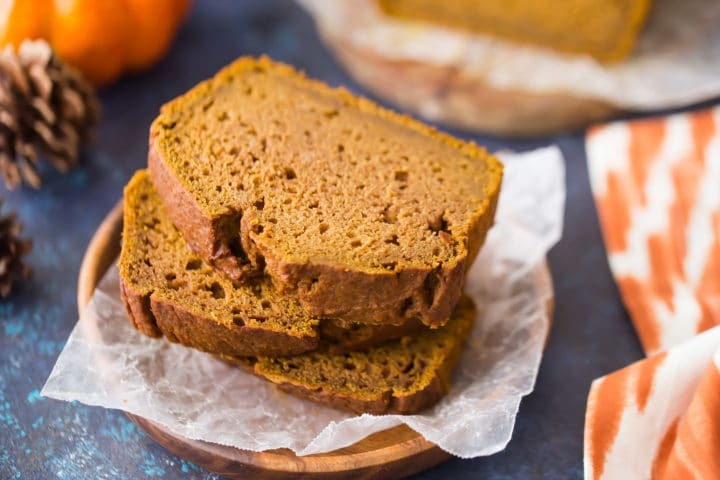 I was searching and searching for a pumpkin bread recipe that wasn’t loaded with sugar, and I’m so glad I found yours! I doubled the recipe and both loaves came out perfect… It was just the right level of sweetness for me and my husband and was even more delicious with some lightly sweetened cream cheese frosting on top *_*… This recipe is totally a keeper — thank you so much for posting it! My pleasure Angie! I’m so happy you enjoyed it. It definitely is a bit less sweet than what you’d typically see. Thank you for the 5-star rating! Hey Angie! You could use the same amount of sour cream or buttermilk, in place of the Greek yogurt. And your instincts are good- it provides all of those things and the slight sourness also helps to activate the leavening. If you don’t have any of those ingredients, you can sour regular milk by adding a little lemon juice or white vinegar. It works in a pinch, but the batter won’t be quite as thick. Hope that’s helpful!